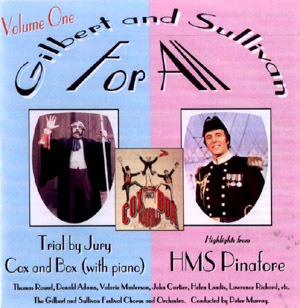 This was one of many recordings made by Gilbert and Sullivan For All, a concert group formed by former D'Oyly Carte Stars Donald Adams and Thomas Round. The text is the Savoy Version, that is, the abridged version of Cox & Box that D'Oyly Carte used as a curtain-raiser. The performance includes complete dialogue and piano accompaniment. Incidentally, some published copies of the recording claim that Lawrence Richard played Bouncer, but Leon Berger assures me that it was, in fact, Tom Lawlor. Moreover, some copies credit Peter Murray as accompanist. It is actually John Burrows, who told me that the recording was made in a single three-hour session, without prior rehearsal. It is a very strong performance, considering that. Cassette 974193/8 Boxed set called "Greatest Operettas of Gilbert and Sullivan," eight discs comprising the entire Gilbert and Sullivan For All output. Apparently available under the same catalog number on both LP and cassette.